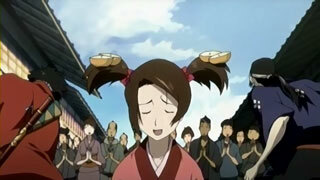 Samurai Champloo is about a girl named Fuu who one day meets two samurais though a series of events that you will just have to find out about in the first episode. The two samurais, Mugen and Jen, are almost complete opposites except for the point that they are both extremely skilled samurais. They had no intention of working together and if it weren’t for the flip of coin that supposedly was tails they would never be helping Fuu. I am leaving one very important detail out though, the reason why Fuu wanted Mugen and Jen to go with her. She needed them to help her find, "the samurai that smells like sunflowers”. At first, Mugen and Jen are left in the dark as to who the samurai that smells like sunflowers really is, and it stays like that for quite a while. Additionally, many occurrences throughout their journey tend to sidetrack them from their main goal, finding the samurai who smells like sunflowers. Samurai Champloo has to be one of the best amines this year, combining an interesting storyline with wonderful graphics and a not so common theme of music heard in anime. Additionally, you may notice some non-fictional historic references throughout the story, which really adds to the overall interest of the storyline, combining fictional and non-fictional elements. The three main characters are all very well defined personality wise, and they all seem to change somehow by the end of the story. So it is highly unlikely you will get bored with the characters by the end of the series. Mugen is a samurai who loves to start trouble you could say. If there is a chance for a fight, he will almost always take that chance, disregarding the safety of others. One of his main goals in life seems to be the will to fight someone worthy of his skills. 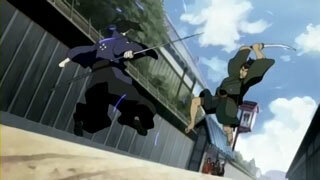 Jin is a quiet samurai who seems to be respectable of others and isn’t so prone to start a fight as Mugen is. However, he also seems to have the will to fight someone worthy of his skills just like Mugen, but not to the extreme extent that Mugen does. Fuu (not to be confused with foo...if you don't know what foo is just ignore this :-P) is basically the center of the whole story, being the person that brought Mugen and Jin together by the luck of a coin. She seems to have a centered personality that is sometimes like Pacifica’s personality from The Scrapped Princess, but just like Pacifica, she isn’t always so self-centered. Finally, did I mention she has a flying squirrel that lives in her clothes? As I mentioned at the beginning of this review, the theme of music is a little different than what you see in most animes, having a rap-like beat. This really adds to the overall originality of the series and is sort of a relief from other types of music seen in other animes. Also, it is pretty interesting to hear rap-like beat music while watching a story that took place in the time of samurais. As for the OSTs, they were all pretty good. The only problem I had with some of the music is that it would drag on for 4 minutes with the same, exact beat with no dynamics. Other than that though, I really enjoyed all of the OSTs. Finally the voice acting and sound affects in the series were very good and there really isn’t much I can criticize about them. 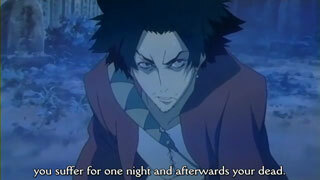 Samurai Champloo definitely does not lack in the graphics department, having wonderful character design, scenery, etc. with very few flaws. Graphics were smooth and nicely animated and the shadows couldn’t have been done much better. There really isn’t much more I can say so make sure you check out the screenshots for a better idea of the graphics. 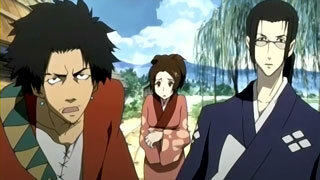 Samurai Champloo is definitely the one anime to watch, having superb graphics, sound, characters, and more. The storyline is interesting and the filler episodes are always very enjoyable, usually involving some amount of humor. 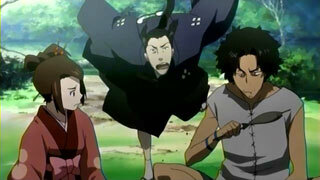 If you are looking for a little humor, some action, and an overall great anime, then Samurai Champloo is for you!